My first ever blog post...and I'm speechless! Not really, but I feel that I should at least give the slightest impression that I'm not too over-the-top! Now bear with me..I'm new to this. There are so many gadgets, how's a girl to know which one to push? I'm learning! BUT..here's a sneek peak at what you can expect to see here at Penny Pinching NBC! Large Navel Oranges 25¢ ea. **Catalina Deal! Buy 5 in a single transaction and earn $1 OYNO! - 35¢/1 Q (1/4 SS) **This Q will not triple on it’s own. It does not say “do not double/triple” so if you point it out to the cashier they can manually triple the coupon. If they refuse then I suggest just putting the soap back. Have you received your free Suave coupon from the Suavenomics promotion last month? 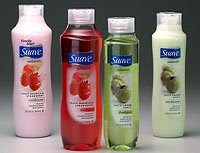 If you get it by Saturday, here’s a great CVS deal to get you three FREE bottles of Suave, not just one (after ECBs)! Thanks for sharing this great deal, Saving with Shellie! it turns out there is a major problem with this deal. walgreen's does not have their own coupon programmed into the register system. hopefully they will fix this soon. if you like, you can try to convince the cashier to enter the coupon manually. good luck! Who doesn't know a guy (or gal) doing a home improvement project these days? This $10 off $50 printable or online coupon is good at Lowe’s. Had no idea, but your Home Depot may take this coupon - they honor competitor coupons! Coupon expires 3/2.